There are people out there that tell me I should use a high tensile strength machined steel sleeve. They tell me that this is the only true way to make sure that the sleeve needed will resist the stresses put upon it while in off-roading situations, and at the same time, last. Well, I disagree. Who am I to disagree? Honestly, no one special. I’m not an engineer. Nor am I a metallurgist. I am however, a person that has fixed in mind, the approximate duration of the these particular type of bushings, with this particular kind of inner sleeve. See, I have seen, and used high quality machined sleeves before. 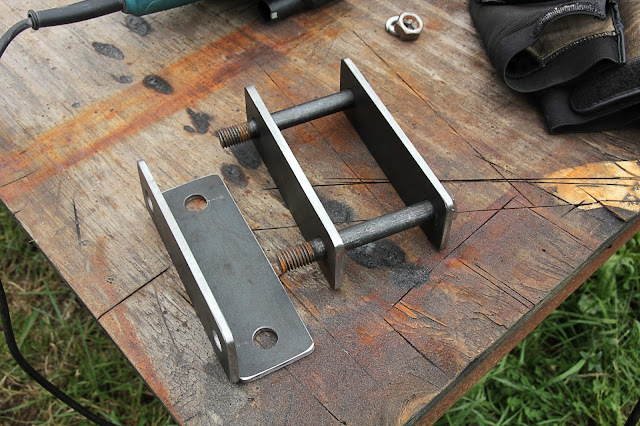 I have also used the DIY mild steel sleeves like the one that I make in the Beginners Fab episode above. So, I’m not completely ignorant. From my personal experience, I have found the following to be true in my own personal case. One important thing to keep in mind, is think about how much you actually will use this rig off-road, and what king of off-roading you will be doing. For instance, my style of off-roading is not some thing that typically requires huge amounts of flex, under large torque strains. So, the force put against all the components (i.e. bolt, leaf eyelet, bushing, and Bushing sleeve) are relatively small. This is not to say that these components don’t get mashed, twisted, and so forth. They definitely will. However, I’m just pretty sure that the forces applied will not be greater than the resistance that the chosen materials con handle. Another thing to keep in mind, is the durability, or longevity of the components. Particularly speaking about my situation, Chile has some fairly strict government requirements for legal vehicle road worthiness. As such, I can pretty much guarantee you, that my leaf spring bushing will need to be replaced in a year. So, if I have to replace my bushing in a year, do I really care about the inner sleeve wearing the inside of the bushing a bit more, than… let’s say, a fully machined inner sleeve? No, no I do not. Therefore, having a more elaborate and “higher quality inner bushing serves me no overly beneficial purpose. It’s simply, an extra cost for an overbuilt component I do not personally need. Probably the biggest complaint that I will hear, is that the form I’m using to produce this “DIY Bushing Sleeve” is “Hack Work”. I beg to differ this statement. Who’s to call it “hack” work? If… my component last a reasonable amount of time, doesn’t get overly fatigued, and isn’t something that is aesthetically vulgar, can it really be considered hack work? No, not at all! It may not be “Boutique Builder” quality, but then again, how many of us have after market OEM parts from the parts store on our rigs or daily drivers? Are all aftermarket oem parts “hack”? No. So, the term “hack” has been misapplied a lot. All that being said though, I will admit, that there are certain situations that would definitely require a better quality component, as an inner/bushing sleeve, than what I have fabricated in this episode. Here is a particular circumstance that I can think of. Large amounts of flex with a very stiff bushing. Under these circumstances, it’s a good idea to use a higher strength inner sleeve. Reason for this is because of the force application transmitted to the inner sleeve edges by the bolt. Here’s what I mean. If you have a bushing that is really stiff, and you apply a large amount of pressure to the outside edge of the bushing, the bushing with give in a very particular area. It will compress the bushing directly where the bolt is transmitting it. Because of this, once the bushing has compressed standard to it’s designed max, there will be a fight amongst the components. Which ever is the weakest link will be the one that is stressed a will be molded by the pressure. If, for instance, you use a weak inner sleeve, the weakest link of the three components is the inner sleeve. Therefore, the inner sleeve will be bent into an oblong shape. (Note: Having an oblong shaped inner sleeve can cause excessive and abnormal wear. Reducing the life of your bushing.) If, however, you use a high tensile strength, thicker wall sleeve, they extra pressure will be resisted by the inner sleeve, and your bushing or bolt will be the component to give. Most likely, the bushing will give until it tears. Bent bolts are typically caused by running worn out bushings, or a poorly designed suspension. All in all, the cost of me making my inner sleeve myself, and the expected time of durability, makes this DIY project a perfect fit. Once again though, I’m speaking of my particular situation. Still, if you needed a thicker wall sleeve, there are thicker piping and tubing that you could use in a ver similar way. That way, you could still have an inner sleeve that resist the forces your suspension will be subjected to, and still not have to pay a machinist cost. Please note: All links with an (*) beside them, are affiliate links. When purchasing an item thru these links, www.ericmcgrew.tv, www.offroadindependence.com, and www.beginnersfab.com recieve a small percentage of your purchase price. This, is a HUGE SUPPORT to me and my sites, that help me continue in my efforts to create, produce, and promote the ORDIP podcast, as well as all Beginners Fab content. Thank you for your support!